Location: Switzerland is located in Western Europe and it shares borders with Germany, France, Italy, Austria and Liechtenstein. Capital: Although there is no formal capital city of Switzerland, Bern is often considered to be the capital. The Swiss flag can be both shaped like an oblong (as above) or square-shaped. It has been used as the national flag, in its present form, since 1889. Switzerland is landlocked – it doesn’t have any coastline. It is one of the richest countries in the world. Although the landscape of Switzerland is dominated by the Swiss Alps, most people live in a region known as the Swiss Plateau – a partially flat area between the Alps and the Jura mountain ranges. Two of the cities in Switzeland – Geneva and Zurich – are internationally important finincial centres. Switzerland has traditionally been thought of as a neutral country. Switzerland wasn’t involved in World War 1 or World War 2 and it hasn’t been in a state of war since early in the nineteenth century. There are more than 1500 lakes in Switzerland, including Lake Geneva (which is also in France) and Lake Constance (which is also in Germany and Austria). The highest mountains in Switzerland are Monte Rosa (4634 metres) and the Matterhorn (4478 metres). Switzerland is a member of the United Nations (it joined in 2002) but it’s not a member of the European Union. 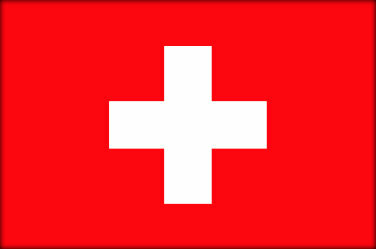 The Red Cross began in Switzerland, and its symbol is the Swiss flag in reverse (a red cross on a white background). The headquarters of the Nestle company is in Switzerland. Switzerland is one of the world’s largest exporters of watches. Johanna Spyri, the author of Heidi came from Switzerland. Winter sports, such as skiing, snowboarding and mountaineering, are incredibly popular in Switzerland. Football (soccer) and ice hockey are also popular in Switzerland. Tennis stars, Martina Hingis and Roger Federer, are both Swiss. Switzerland is known for its cheese (Emmental and Gruyere). People from Switzerland eat more chocolate than anyone else in the world. Swiss chocolate is famed for its high-quality. Glad you liked it! Thanks for letting us know. It says that there is no capital of Austria. Isn’t it ment to say Switzerland? Yes it is! Well spotted.